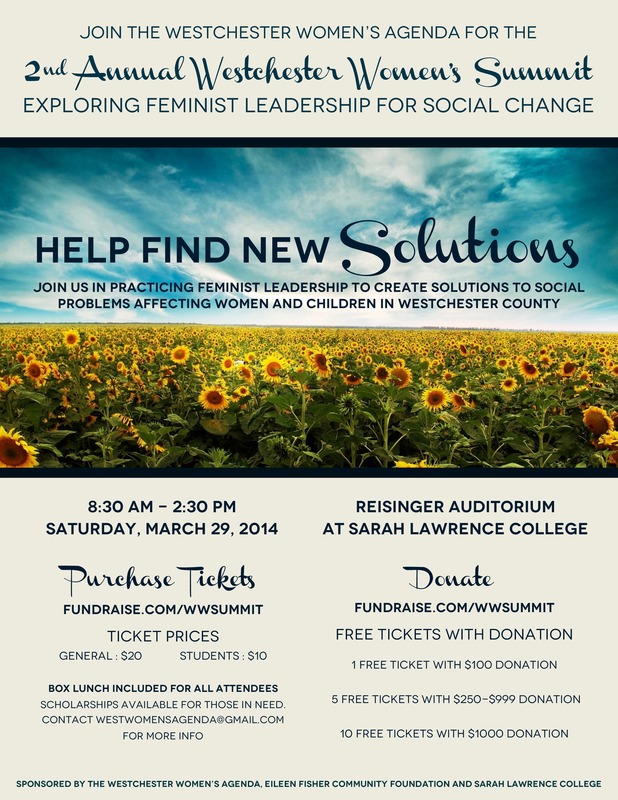 This year’s Summit, whose theme is “Feminist Leadership for Social Change,” will be co-sponsored by the Westchester Women’s Agenda (WWA) and Sarah Lawrence College and will take place on Saturday, March 28, 2014, on the Sarah Lawrence campus. It will focus on the motivation and training of participants in feminist leadership practices and the application of those practices to the development of creative solutions to social problems affecting women at the local and/or county level. The outcome of this year’s Summit will be one or more proposals for at least one community-based project that will significantly improve social conditions for an under-served population of women and children in Westchester County and that will involve substantial cross-sector collaboration. Our goal for the Summit is to use the feminist lens to develop a common agenda around which we can develop collective energy, attract key stakeholders, and begin to build the trust necessary for more effective cross-sector communication and collaboration among leaders of different generations. We plan to invite women leaders of different generations who will share their experiences, challenge our thinking and work with us on the facilitation of feminist leadership exercises. Breakout sessions will be used to arrive at creative project-based solutions to specific social problems in each of our issue areas. As we did last year, we propose to incorporate existing interactive voting technology to facilitate live decision-making and prioritize the different projects, in order to arrive at one or more collaborative projects which are worthy of additional support. Member organizations of WWA serve a wide variety of underserved populations in Westchester County; including the 28% of female-headed households with children under the age of 18 who live in poverty; the 3,182 severely overcrowded households; the 20% of county households who pay more than 50% of their income on housing , the 1 in 4 women who will be raped in her lifetime, the victims of sexual assaults and domestic violence, almost half of which go unreported; the families whose child care financial assistance has been reduced since 2010; the youth aged 16-19 whose unemployment rate in Westchester is 29.6%; and the 4 out of 5 persons whose need for free civil legal services cannot be met by existing programs. Thank you to everyone who helped us reach our Fundraising Goal of $10,000! Thank you to all those who attended the first ever Westchester Women’s Summit! Women from all over Westchester County will be gathering at the Yonkers Riverfront Library on Saturday, March 2 at 8:30 am to confront the issues concerning women in the County—issues including economic development, housing & homeless prevention, violence against women, health & mental health, children’s services, civil & criminal legal services, and immigration. Their goal is to engage women in creating a stronger, more just, and more egalitarian Westchester. The event is sponsored by the Westchester Women’s Agenda, with financial support from Eileen Fisher and others. Planning for the Summit, the first of its kind in Westchester, grew out of the realization that the economic downturn which hit the United States in the period of 2007-2011 has also created hardship in Westchester County; particularly for women and children. For example, according to the U.S. Census, over the last 5 years the percentage of people in poverty in Westchester rose by over 50%, from 4.9% to 7.5%. For families headed by women, with no husband present, the poverty rate in 2011 was 22.4%. The comparable figure in 2007 was 15.9%. While incomes dropped over the 5-year period from 2007-2011, the relative cost of rental housing increased. In 2007 43% of households paid 35% or more of their income for housing. By 2011 that percentage had risen to 48%. Owners’ costs also rose relative to income, but not as much. For owners the rate of increase was 4%. For renters it was 12%. There are also great disparities between communities within Westchester. For example, according to data provided by the Westchester Children’s Association, in Briarcliff in 2011 99% of high school students graduate within 4 years. In Mount Vernon the rate is 53%. The 4-year college readiness rate in Bronxville in 2011 was 99%. In Yonkers it was 14%. Keynote speaker for the Summit will be the Rev. Noelle Damico, who serves as the Associate for Fair Food within the Presbyterian Church’s Hunger Program and coordinates the PC (USA) campaign for Fair Food. A sought-after speaker and educator, Reverend Damico has been a keynote speaker on human trafficking issues and writes and speaks on the church’s role in advancing a human-rights based approach to addressing modern-day slavery. She lives in White Plains and is active in local food justice, conservation and religious organizations. State Senator Andrea Stewart-Cousins will deliver welcoming remarks to the gathering. Break-out sessions will take place in each of the proposed issue areas, at which participants will discuss specific challenges and decide on priorities for action. The event is open to the public. Registration is free, but participants must register to attend. Tickets are limited. Congrats on putting together this much-needed summit!